What seems a normal way to go about getting things done could actually be getting in your way of getting things done! We are brought up to think the best way to get stuff done is to start and keep going until we finish, however long that takes. As we get older, our lives become more complicated and we have more responsibilities. Unfortunately, as we get busier we don’t get more time allotted to our lives. We are all stuck with the same amount of time. So something has to change because we often don’t have enough hours in the day to start every task that needs to done and work until we naturally finish them to the best of our abilities. This is where the Time/Value ratio comes in. Instead of starting every task and working until you finish it taking you a little time or a lot of time, you decide upfront how long the task will take before you even start the day. How does this help? How is this different thinking? You decided ahead of time how long you can give to each task based on how much time you have and the value of the task – not on how long it might take you to complete the task. A work example I use often with my clients is that you have 8 hours to work and during that time you must complete two articles. One article is for your local limited run newspaper and the other article is for the New York Times. Both articles are to be of the same length and you have already done your research. 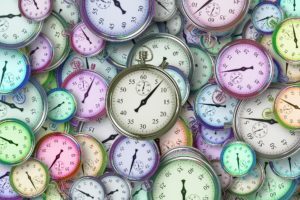 Should you just split the time you have and give 4 hours to each article? It depends on your goals and values. Most likely the NYT article is more important and has more value to you because it reaches a much larger audience then your local limited run newspaper and carries with it a level of prestige that could elevate you or your business higher than your local paper. More bang for your buck – right? Actually, it is more bang for your time! In this scenario, instead of splitting your time equally the better thing to do would be to put the majority of your time into the NYT article and a minority of your time into your local paper article. This might result in taking 3 hours for the local paper and 5 hours for the NYT article. What this means is you allot your time based on the value of the task – not on how long you COULD spend completing it . Another example is my newsletter. I could spend days creating a great newsletter each week but the return is not worth spending days on it. I know based on the open rate of the newsletter each week roughly how many people actually read it. (Thank you if you are one of those people.) Those numbers, my return on investment of time, tell me that it is good to do the newsletter, but it alone won’t grow my business – a value of mine. Therefore, I only allot a certain amount of time to write each newsletter because there are other tasks that have higher returns that I am responsible for also doing in my business. I could write the newsletter in 30 minutes, an hour, 5 hours or more. I look at the value of the newsletter in relation to all the other things I must do each week and decide ahead of time how much time the newsletter will take. What is done in the allotted time is what is done at that time! I need to move on to the next thing that has also been designated as to how much time I will put into it.. Tomorrow, look at the tasks on your list and decide the value of each task. Look how much time you have to complete those tasks and make smart decisions on completion times for each task. The smart decisions are decisions that look at the value based on your goals and priorities each task has in relation to the time you have.